Hard to believe, but we are here. The final week of the regular season. For smaller schools, playoff time is here. The season has flown by. Stratford, Goose Creek and Hanahan have been the three dominant teams in the Lowcountry throughout the season. All entered last week with perfect records. Only Goose Creek and Hanahan escaped. In other news, James Island football coach Randy Hilyer has stepped down after three seasons at the school. The Trojans finished 2-8 this season after losing to Orangeburg-Wilkinson last week. The news was announced Tuesday night. They will begin searching for a coach after the playoffs. In 2014, the Trojans are moving back up to 4A to play in a region with Cane Bay, Goose Creek, Stratford, Wando and West Ashley. Hilyer will still teach at the school. Last week, South Florence beat Stratford in a quagmire in Florence. Jacob Park did not play well, but he still has great stats so far this year: 27 touchdowns, 4,200 yards, and a 60% completion rate. South Florence stayed undefeated at 10-0 with the 26-14 win. Now they face West Florence to try and complete the undefeated season. Summerville clinched their region with a win over Ashley Ridge. Goose Creek took care of business against West Ashley. Wando beat win-less Cane Bay. Beaufort got the win against Fort Dorchester last Friday night, creating a four-team tie at 2-2 for second place in 8-4A headed into the final week. Beaufort hosts Colleton County; Fort Dorchester travels to Ashley Ridge; while Bluffton hosts Summerville. A lot will be decided in this final week, with one biggie game that will be the best so far in the Lowcountry this year. In 3A, everything's decided for regular season. Hanahan beat plucky Stall to finish a perfect 10-0 regular season. Orangeburg-Wilkinson beat JI to take second place. Berkeley upset Hilton Head at Hilton Head to take third. Hilton Head, who was in the running for winning region a few weeks ago, now is fourth in the region and have to make the long trip to Socastee Friday. Things were less clear-cut in 2A; Bishop England though went to Ridgeland-Hardeeville and won, clinching their region. They had to win, or they could risk not even hosting their first round game. They earned a bye in the playoffs, along with Woodland. Timberland and Lake Marion also earned byes in the 2A playoffs locally. In 1A, Cross is the top seed in Division II. They face Lincoln. They bounced back under Coach Shaun Wright. Military Magnet also gets a home game. Branchville travels on the road. In Division I, St. John's hosts a playoff game, while Baptist Hill goes on the road. SCISA has several interesting stories this year. Porter-Gaud travels to Hammond in AAA play; Northwood Academy hosts Spartanburg Christian; Palmetto Christian travels to Calhoun Academy; Colleton Prep hosts St. Andrews, and Dorchester Academy hosts Trinity-Byrnes. James Island Christian hosts Clarendon Hall in 8-man play, while Cathedral goes to Patrick Henry and Beaufort Academy goes to W.W. King. 5. Southside (6-4) at Hanahan (10-0) (3A): Hanahan starts their playoff quest with Southside. Many people have very high expectations with the Hawks this year. 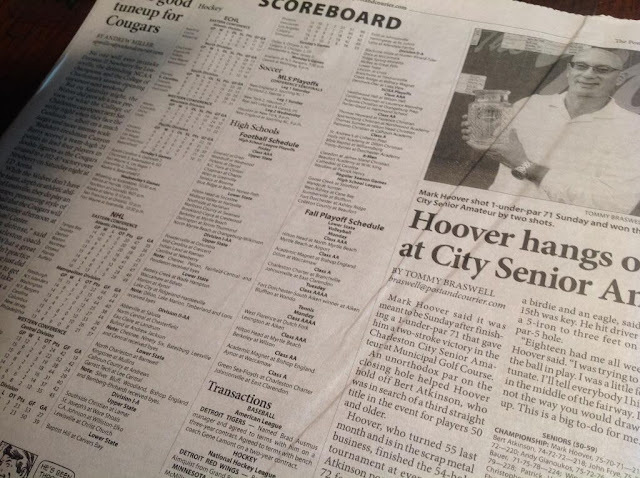 Hanahan has run through their schedule, only giving up 87 points through the entire season. Against two of their region rivals, O-W and Hilton Head, they gave up 42 combined points. The rest of the year, they've only allowed 55 points. They have the best defense of any school in the area. Southside has limped into the playoffs with three straight losses. The Tigers started 4-0 but have lost four of their last six. But you can throw out the records in the playoffs. Everybody's 0-0. Major upsets have happened before in the playoffs. Unfamiliar opponent with a week to prepare? The Hawks don't want their season to end with the upset bug. 4. Clarendon Hall (7-3) at James Island Christian (8-1) (SCISA 8-Man): Living on James Island, it is easy to follow the fortunes of your local teams. I can hear the JI football games from my house, and only a stone's throw away is the field where First Baptist and James Island Christian play. James Island Christian has been a nice story this year. They got their coach from the Citadel, Chad Wheeler, in August. Nobody expected much; but they have delivered with an 8-1 record and their only loss a 4-pointer to Beaufort Academy. They have some very good athletes, and light up the scoreboard in 8 man. The least amount of points they've scored in a game are 28. They face Clarendon Hall this week, a team with two guys over 1000 yards rushing; Dustin Way and Tilton McCrea. This will be a very good game to watch in this fun brand of football. 3. North Myrtle Beach (8-2) at Orangeburg-Wilkinson (9-1) (3A): Orangeburg-Wilkinson has been a very good team this year in 3A football. O-W started the year with a soft schedule, not facing a larger school until Richland Northeast in late September, but since then they have played all 3A opponents. They gave Hanahan their best game of the year, only losing by seven points in Orangeburg. They dominated Stall and Hilton Head, got a big win at Berkeley, and pulled away last week at James Island to win their 9th game. North Myrtle Beach will make the nearly 3 hour drive from the Grand Strand armed with an 8-2 record, but because of their region losses are third in their region, thus drawing a road playoff game. The Chiefs lost last week to Myrtle Beach, but were on a 3 game winning streak prior, with two of those wins shutouts. This will be a good one. 2. Baptist Hill (6-4) at Carvers Bay (9-1): Carvers Bay, one of the best teams in the Pee Dee, hosts Baptist Hill in a battle of winning teams. Carvers Bay has improved each of the past three years, to this year winning nine games. Baptist Hill started out fast, but slumped lately. They did beat Military Magnet last week to clinch a winning record. This week they head to Hemingway to face Carvers Bay. 1. Berkeley (5-5) at Myrtle Beach (6-4): This is a very interesting playoff game for many reasons. Berkeley improved over the past weeksafter suffering an embarrassing 18-point loss to O-W at home. They upset Hilton Head last Friday night to earn their fifth win of the season. Berkeley finished third in the region with a 3-2 mark with the win. Therefore, instead of having to play undefeated Socastee, they get to face 6-4 Myrtle Beach in the first round. Myrtle Beach is on a three-game winning streak, but started the season 1-3. They beat North Myrtle Beach last week 30-28. QB Drayton Arnold is only a sophomore, but he's thrown for 14 touchdowns this year. The Seahawks are also led by HB Brandon Sinclair, another sophomore, who's run for over 1500 yards this year. This looks like it will be an interesting, evenly-matched game. Now, on to the 4A ranks. Here are the games. The scenarios I have are from the wonderful bracketologists at www.scpreptalk.com. West Ashley (5-5, 0-3) at Cane Bay (0-10, 0-3): West Ashley has had an improved season this year, but probably won't make the playoffs even with a win at Cane Bay. The Cobras season has been very poor. They've scored just 118 points and allowed 337 going to the final game. Wando (4-6) at Sumter (5-5): Wando makes a trip to the Gamecock city to face Sumter Friday. Wando looks likely to be in the playoffs, but as a low seed. Sumter has improved lately, winning three straight games to salvage their season. Sumter can get a winning record with a win. Colleton County (2-8, 0-4) at Beaufort (7-3, 2-2): The Eagles look to have clinched a playoff berth with their seven wins already on the season. The concern is seeding. Beaufort with some help Friday can clinch an automatic spot in the playoffs. They need a win though, otherwise they could be a low seed having to travel. Summerville (8-2, 4-0) at Bluffton (6-4, 2-2): Summerville has already clinched their region with a win last week against Ashley Ridge, but this week travel to Bluffton hoping to improve their playoff seed. Bluffton needs a win and a lot of help to make the playoffs. The results have to go just right for them to have a shot, but anything can happen. Fort Dorchester (6-4, 2-2) at Ashley Ridge (4-6, 2-2): In a rare Friday night televised game, the Swamp Foxes host Fort Dorchester basically needing a win to make the playoffs. Fort Dorchester needs a win to improve their playoff position. From scenarios I've seen, a loss would make Fort D the 14th seed in their playoff bracket. A win would make them the 11th or 12th seed. With our complicated points system for playoffs, that could change though, since almost every 4A game is connected with the playoff picture. This is still a huge game between two huge Dorchester County rivals. Goose Creek (10-0, 3-0) at Stratford (9-1, 3-0): This is the biggest game of the season in Lowcountry high school football. For weeks, everything has been pointed toward this football game. Likely the two best teams in the area, a neighborhood rivalry, both undefeated until last week when Stratford lost to South Florence. The Region 7-4A title will be determined on the field Friday night, along with a top playoff seed, likely in front of a huge crowd. The battle between Jacob Park and Dantez Bennamon will be interesting to see. It will be the most intriguing part of this game, even as Goose Creek's backup RBs have become an integral part of their offense. Last week, both Caleb Kinlaw and Evan McField were out. The top RB was Tyrik Johnson, a junior. All he did was run for five touchdowns. Even though Johnson only touched the ball twice in a two-game stretch, he's had twenty touchdowns on the year. The Knights have to slow down Goose Creek's running game to have a chance to win. Goose Creek's defense also has to step up against Jacob Park. With his passing ability, he can test the Gators secondary unlike any other QB. Carolina and Clemson are both off this weekend. Charleston Southern and SC State are the only local games. Come support your local high school team. Enjoy the games!